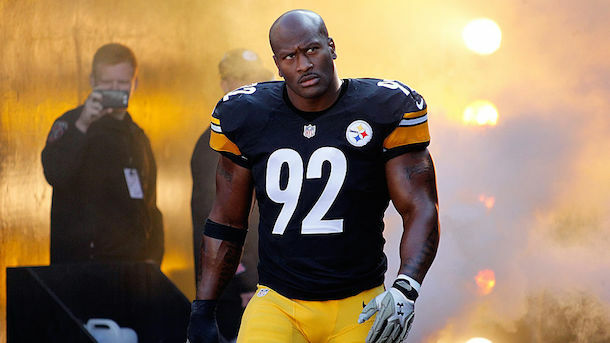 Pittsburgh Steelers linebacker James Harrison is a legendary gym rat. This past winter, after the Steelers earned a hard-fought playoff win on the road against the Kansas City Chiefs, their plane arrived back in Pittsburgh at 4 a.m. Instead of going home and going to bed, Harrison went straight to the gym to work out. This is probably why, even as he’s about to turn 39 years old, James Harrison is still freakishly strong and effective. It’s probably also why he was subjected to nine “random” drug tests last year. Harrison isn’t letting the PED suspicions cramp his style, though. This offseason he’s been at the gym pretty much every day, doing absolutely insane sh*t that normal people wouldn’t even dream about doing. I don’t know about you, but I’m gonna stick to basic curls, squats, and lunges, and leave this stuff to the professionals.